When the 20th person sent it, I clicked the link. Though I was crazy-busy in late September, a whole slew of colleagues and friends encouraged me to apply. Having already thought long and hard about what the future of climate journalism ought to be, I put some ideas together, and sent them an application. Those ideas, though, actually still seem relevant to me — more relevant, in the wake of the 2016 election and the rise to power of Donald Trump. So I’m going to share a shorter, edited version (with some fresh links) of that vision here. How can we revitalize climate reporting? Here are my ideas. 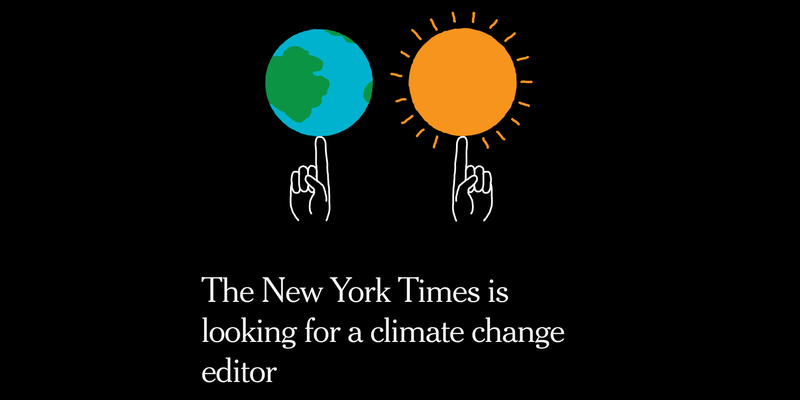 The New York Times is undertaking this effort at an amazingly opportune moment.I’ve been working at the forefront of climate and sustainability journalism for more than two decades now. I see the field on the edge of a major shift. Climate journalism is about to be transformed. The Times could be at the forefront of that transformation. It’s time to rethink the aims of climate journalism, its approach to coverage and its targets for audience engagement. The Times can lead by being willing to step past the current debate and seek out new audiences, new voices, and new methodologies that all work together to enable powerful storytelling about complex and fast-changing systems. 1) It’s by narrowing its climate audience that the Times will grow its reader engagement. 2) It’s by making its reporting more complex that the Times will make these issues easier to understand. 3) It’s by making its coverage more exploratory that the Times will make that coverage more vital and authoritative. Let me explain each in turn. Many people already understand the reality of the greenhouse effect well enough to see that we need to be acting to reduce greenhouse gas emissions and prepare for climate impacts. Some, though, not only understand the basics, but have begun to grapple with the larger challenges of how do we learn more about what’s coming, how do we act, how do we prepare. Narrowing the audience focus of climate coverage to concentrate on these informed climate readers — even if it alienates readers who are less informed or politically opposed to climate change — can energize these readers. Informed climate readers are not a small audience. The Yale Program on Climate Communication has been studying American’s perspectives on climate change for years now. As of March 2016, they found 45% of Americans have deep concerns about climate change, with 19% of American voters already what they term “alarmed” about climate change. These people already have basic understanding of climate change as an issue, and are scared. They think it’s serious crisis, that they’re feeling the effects now and they support real changes. I suspect that Times readers include a disproportionately high number of these people. These readers have an unmet need. They need climate journalism that deepens their understanding of the stories and conflicts and choices around how we act, how we prepare. They need climate coverage that’s keeping up with the speed of change. They need climate coverage that speaks to the questions they have about that change. All the coverage that The Times’ climate desk does should be aimed at serving these readers. By making coverage more vital and compelling to the people who already know and care about climate, the Times can not only grab their attention, but find fresher angles and untold stories that are likely to be more interesting to others as well. In my experience, informed climate readers have different concerns and passions than other readers. A) They want to know about solutions to the crisis we face. They’re done with the endless, fraudulent debate about whether climate change is real or not. They’re done with coverage that focuses on denialists and politicized attacks on science. Even more: they want journalism that has itself moved on to report actual reality. The biggest single story on our planet is the fight over the pathways to zero emissions. There are serious debates about the best ways to cut emissions, who’s responsible and what our total “carbon budget” can be. A host of solutions are being brought forward. Critical solutions journalism can offer a great window into the larger, systemic challenges of the “race to zero.” Readers deserve great inquiries into these issues. B) They want to know what impacts to expect. The scientific debate about the existence and causes of climate change is settled. We know climate change is happening, human-caused, and almost entirely the result of energy consumption, land use changes and industrial processes. The only genuinely interesting story on causes is the emergence of feedback loops (for example, carbon dioxide and methane leaking from melting permafrost). The much, much more critical story concerns the science of effects. How much warming can we expect? How much will the sea rise? How far will weather patterns shift? What are the second- and third-order risks of climate impacts (for instance, how can the Western U.S. prepare itself for future megafires)? What are the limits on our ability to adapt to, ruggedize for, insure against and rebuild after climate-connected disasters? One idea: A series of frank decade-by-decade examinations of the risks and impacts faced by people in a particular metropolitan region. Pick one city. Ask, What are the range of possible impacts over coming decades, as we can understand them now? What kinds of preparation could the region undertake. What are the limits of preparation? What are the possible economic impacts — not only of disaster damage, or industrial shifts, but from potential changes in insurability, in finance availability and quality of life? Will the region be better or worse off than other regions like it, and how can we best think through that question? In short:Use the story of one city to report on the kinds of challenges people everywhere will face as our planet’s systems shift and grow more chaotic. Create a climate microcosm. My direct experience is that people are fascinated with the questions about the shape of the world to come. They worry about impacts to their own lives, families, jobs and communities. They want to get a sense of how changes might feel as we live through them. One of the biggest failures of climate journalism to date has been its inability to bring home to readers changes that have already occurred, and make real those changes that are already underway. Scientific caution has made journalists who report on that science loath to translate probabilities into on-the-ground observations. Obviously, no good reporter wants to exaggerate or ignore the science. Understanding that we cannot decisively prove that any given event would not have happened without climate change is one thing; not being willing to discuss the current and coming realities of climate change on the ground (as they are experienced by readers), is another. Speculation and imagination, properly contextualized and precisely reported, have a role to play in bringing climate change news down to earth. Journalism about the future and how it might feel (what I call “anticipatory journalism”) is hard to do, but essential. Anticipatory journalism demands engagement not only with foresighted experts, but with those whose business is imagination, like artists, futurists and science fiction writers. One possibility: have a weekly online feature where a visionary is asked for their take on how one specific aspect of life might change (maybe for the better) as the climate crisis deepens. 2)It’s by making its reporting more complex that The Times will make these issues easier to understand. The challenging nature of climate change reporting stems from the fact that it’s almost impossible to think well about climate without eventually practicing planetary thinking. The climate crisis involves the interplay of complexly interconnected planetary systems — both human and natural — that are changing at a speed human civilization has never before encountered. The systemic nature of climate changes means all real news about climate change is news about systems. That, in turn, means that to cover climate change well, we need to practice systems journalism. Systems journalism is a new, evolving approach. Most climate reporting is stand alone reporting, with limited connection to other stories and little attempt at building reader understanding of larger systems. As a result, we get a classic “the blind men and the elephant” problem. One can read hundreds of well-written stories and still not have a working knowledge of the issue. It’s hard to report news in a way that is both interesting and insightful on the particulars of a given story and that contributes to a broader, developing understanding of a complex and interconnected set of issues. Hard does not mean impossible, though. The answer is to cover the set of systems as a whole, and then find new ways to make that coverage accessible to readers. To do this, I propose assembling a great “learning” team — an interdisciplinary group of curious people with multiple subject area expertise as reporters but also multiple skills in how we convey information to people in news stories, conversations, visual design and interactive graphics. That team should then be set to work on the task of educating themselves in public about the natural and human systems that make up the climate crisis — by building their own conceptual models of how these systems work and interconnect, and telling stories about what they learn in the process. By “building to learn” as designers say, the Times’ climate team can develop a new approach that — by drilling down into the complexities of how we define and understand the interplay between systems — helps readers see the big picture, and then formulate their own ideas and judgments about what it all means. Make the assembly of visual, explorable, interactive models of the systems we’re reporting on part of the news process itself. Have reporters share their own insights and observations about the process in podcasts, quick videos and on social media. Make it fun to watch and read about. Make it an adventure. Invite reader participation. In other words, learn in public how to do systems journalism, and make telling stories about that learning the way you develop an audience for that reporting approach. Most climate coverage is reactive. Climate itself, though, is a classic steepening problem — failing to act today makes the challenge harder to solve tomorrow. This steepening means that climate change evolves as a story over time, and it’s now evolving at a rate that’s difficult for most of us to match. Expertise — especially on climate action steps — tends to have a short half-life. Keeping up with the science on risks and impacts is hard work. New information — by the time it works its way into publication and journalists cover it — is often not that new at all. Reactive coverage, in some sense, is always outdated coverage. Getting ahead of the curve is tough work. It demands foresight, focus, and the resources to do real, on-the-ground reporting wherever new insights are emerging. One of the powerful benefits of doing systems journalism right, though, is that understanding systems and the debates about them is the single best way of anticipating where new information or actions or events might change what we know where, in short, climate news is about to happen. One example for consideration: the Intergovernmental Panel on Climate Change will not begin to release its next major report (AR6) until 2020. The studies and debates for that report are already underway, though. By convention, most reporters have waited for the IPCC to formalize findings before reporting them. The debate over those findings, though, is just as interesting and important, and with the right team, The Times could already be telling those stories now. This would mean changing the focus of the coverage — from the diplomatic event of an intergovernmental organization’s formal announcements to the more rough-and-tumble emerging stories of what’s happening, how we know, what it means and what we can do about it — and the people who are in conflict over all these emerging issues. Make the arguments, not the announcements, the news. Doing this, the Times would have these stories years ahead of most other news outlets, and could use the system insights gained from this coverage to further develop its systems journalism approach. Another example: this exploration should also venture into predictive solutions-based reporting. Many of the best thinkers about potential solutions are relatively unknown, even to most Times readers. A whole host of emerging questions and obscure solutions spaces that rarely make it into the news may become incredibly important over the coming decades: finding and reporting the debates about these solutions (which was our core goal when I ran Worldchanging.com) can not only make for great features, but also can offer a fresh angle on over-reported problems. I would suggest beginning with an investigation into the merits and limits of various solutions for sequestering carbon dioxide (by growing forests, for example, or capturing it from smokestacks). Sequestration is increasingly discussed as a needed fall-back response as emission cuts are delayed. Is sequestration really feasible at such massive scales? How? With what uncertainties? Done right, exploratory coverage of fast-changing topics can not only help the Times beat the competition to the punch time and again (making its coverage essential reading), it can also make the more deeply reported stories the Times publishes even more authoritative. Exploratory, frontline coverage of systems, reported in great stories and contextualized through systems journalism, aimed at those who already want honest, fresh perspectives can make the Times the leader in climate journalism. I’d love to lead the team that executes that vision.